Volumetric analysis is an analytical method or procedure for working out the titre or concentration of an analyte in a solution. This is done by measuring the volume of a standard solution of an appropriate reagent whose precise concentration is already known. The procedure is based on the reaction between the solution referred to as the titrant and the analyte which is referred to as the titrand. The most common way of carrying out this procedure is to put the unknown solution in an Erlenmeyer flask and then, using a burette, slowly add the titrant to it. This technique is known as titration. the end point of the titration must be identifiable and reproducible. The titre is the concentration of the reactive. As you should know, concentration can be expressed in various ways (see opposite). We have already seen how titration is carried out by slowly adding standard solution using a burette to an analyte solution until the reaction between the two can be said to be completely finished. But how can we tell when titration is complete? The answer to this is when the equivalents of the titrant and the analyte are the same i.e. have reached their equivalence point. The equivalence point is the point of titration where the amount of titrant is exactly that dictated by the stoichiometry of the analyte. The equivalence point is the ideal result in titration. In effect, what is measured is the end point of a sudden variation in the pysical or chemical property of a solution. there is a variation in the amount of current that passes through the solution. Theoretical titration curves can be mapped out for all kinds of titrations. They serve to explain the theory behind the end point as well as where errors occur. They are graphs with volume of the reagent on the x axis and a function of the analyte or reagent concentration on the y axis. The curve is normally a sigmoid one and the area of interest is limited to that around the equivalence point ((da ±0,1 a ±0,5 mL). The equivalence point of a titration is a theoretical point which cannot be determined by experiment. We can only guess where it lies by observing physical changes associated with equivalence. These changes are known as the end point of a titration. 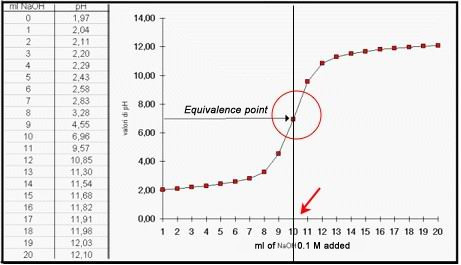 The difference in volume (taken as an absolute value) between the equivalence point and the end point is the titration error. The end point of titration is usually found using an indicator. An indicator is a compound, or a mix of compounds, which undergoes very visible changes, usually to the colour, in response to specific chemical environments. Instruments, as well as indicators, can also be used to reveal the equivalence point (Instrumental Analytical Chemistry). 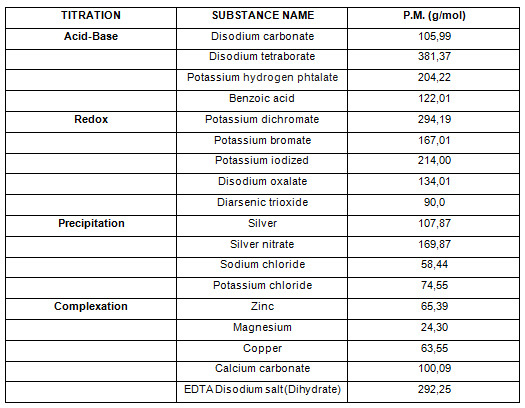 These respond to characteristic changes in the properties of solutions during titration. They include voltameters, ammeters, ohmmeters, colorimeters, pH meters, temperature recorders and refractometers. The validity of an analytical procedure depends on knowing how much reagent has been used. It is possible to work out the exact known concentration of a titrant. primary standard (parent substance): is a sufficiently pure compound that can be used to prepare a standard solution by weighing out (Gravimetric analysis) a certain amount and then diluting it to a defined volume of solution in a volumetric flask. secondary standard: a susbstance whose concentration is determined by reference to a primary standard. Imagine that we want to prepare 5.000 L of a Na2CO3 (105,99 g/mol) solution at 0.1000 M of solid primary standard. 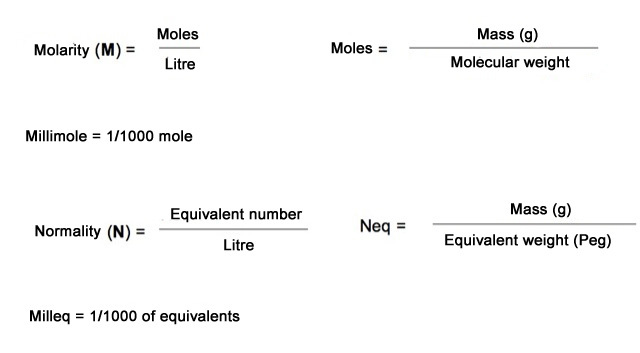 Since the volume is expressed in litres the calculation is worked out in moles rather than millimoles. In the majority of cases titrants are not available in primary standard form. A solution of the titrant at the desired concentration is therefore used instead to titrate a known mass of primary standard. Suppose that we want to prepare 1.000 L of a 0.1 M of HCL solution (36.465 g/mol). Since hydrochloric acid is not a primary standard we need to prepare a solution at approx. the right concentration and then titrate it with a parent substance (Standardisation). Pure hydrochloric acid concentrate for analysis is marketed as an aqueous solution and its level of purity (37%) and density (1.185 g/ml) is indicated on the label. All we have to do then is take 8.3 ml of this solution using a calibrated pipette and put it into a calibrated 1 L volumetric flask and bring it up to volume with distilled water. As we mentioned before, the solution cannot be defined as precisely 0.1 N but approx. 0.1 N so it needs to be standardised. To get the exact concentration, the solution needs to be standardised through titration with a primary standard like sodium carbonate. 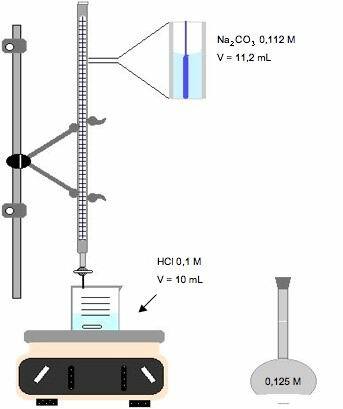 Here we need to take a sufficient amount of sodium carbonate to contain enough equivalents to react with 20-25 ml of the solution to be standardised which is contained in a burette. 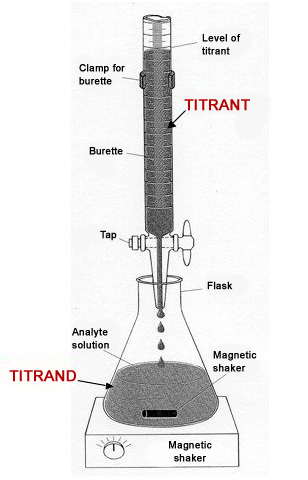 In this case the titrant is the solid parent substance which, after being weighed, is put in an Erlenmeyer flask while the titrand is the solution in the burette. Suppose we have a 0.1 M HCL solution and a Na2CO3 solution at a known concentration of 0.112 N.
Since we know that to standardise 10 ml of HCl we used 11.2 ml of Na2CO3, what is the exact known titre of the HCL solution? It is very important to know, and to know how to apply, the law regarding the dilution of solutions. Suppose we ant to dilute a 0.1 molar solution of HCL by 1/10. Therefore we take 10 mL of a 0.1 M HCl solution using a calibrated pipette and put it into a 100 ml volumetric flask and then bring it up to volume (liquid reaches the ring graduation line) by adding deionised water.